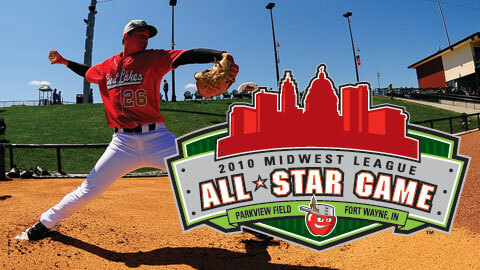 The Midwest League announced today the rosters for the 2010 Midwest League All-Star Game, which will be held June 22 at Parkview Field in Fort Wayne, IN. The Loons will be represented by seven players-three pitchers and four position players-to tie the franchise-high mark set in 2009. The Loons players designated as starters for the All-Star Game's Eastern Division Team are Jerry Sands (first base) and Christian Lara (shortstop), while Loons infielder Rafael Ynoa and outfielder Angelo Songco will be dressed as reserves. The three pitchers are right-handers Will Savage, Luis Vasquez and Allen Webster. Sands has been named MWL Player of the Week three times and leads the league with his 16 home runs, 39 RBI, .688 slugging percentage, 139 total bases, and 33 extra-base hits. He also ranks second in the league in on-base percentage (.436), third in batting average (.351) and runs scored (41). Lara has also been among the league's top ten batters, peaking at .360 on 5/11. Savage was named MWL Pitcher of the Week (5/17-5/23) for his seven-inning complete game shutout over Lansing on 5/22, and is 6-1 this season as a starter for the Loons with a 2.42 ERA (19ERx70.2IP). Webster holds a 2.22 ERA (14x56.2) to lead the Loons starters and rank tenth in the league. Both Savage and Webster are tied for the second-most wins among MWL pitchers with six. The Loons also send relief pitcher Vasquez, who is tied for fifth in the league with 10 saves, to Fort Wayne. The Loons have the most representatives of any Eastern Division team. Cedar Rapids of the Western Division also has seven all-stars. The East is led by Fort Wayne manager Jose Flores and his TinCaps coaching staff. The West is led by Burlington manager Jim Gabella and his Bees staff. Full rosters for both teams are attached to this release. The seven Loons selected this season bring the franchise total to 22 all-stars in four seasons. In the 2009 All-Star Game, the Loons were represented by Tony Delmonico (catcher), Dee Gordon (shortstop), Jaime Pedroza (second base), Kyle Russell (outfield), Javy Guerra (right-handed pitcher), JonMichael Redding (starter, right-handed pitcher) and Josh Walter (right-handed pitcher). The league's Mid-Summer Classic is being held in Fort Wayne on Tuesday, June 22 at 7:00 p.m. The game will be preceded by a Home Run Derby and Skills Challenge on Monday, June 21. Fireworks shows follow both events. The Great Lakes Loons are the fourth-year Single-A affiliate of the Los Angeles Dodgers and members of the Midwest League. For more information about the Loons, visit Loons.com or call 989-837-BALL.